It’s been a year since we launched our mobile app! 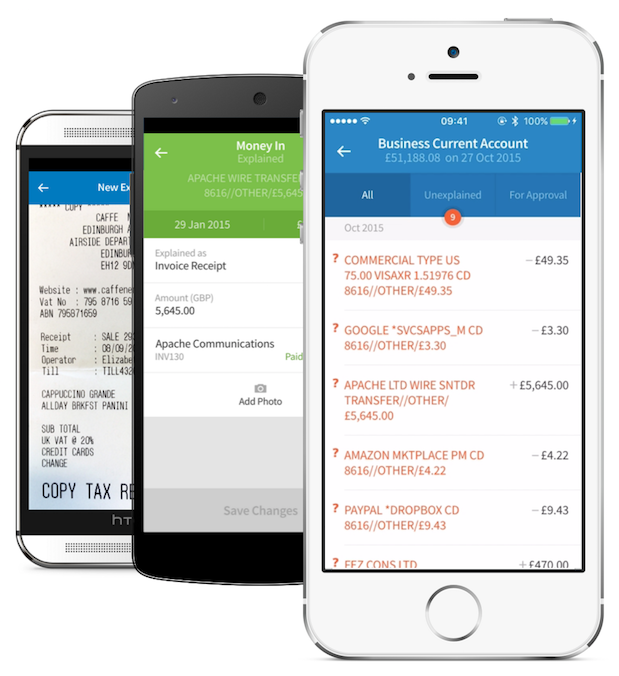 In March 2015 we launched FreeAgent Mobile for iOS. Initially limited to a small feature set, we quickly added new things over the next couple of months: expenses and mileage rebilling, updating and explaining bank transactions, and linking expenses and transactions to projects. In January 2016 we launched our Android version (with the same feature set as iOS), and more recently, we added the ability to upload files from any app on your phone, including Dropbox, Google Drive, and iCloud. For FreeAgent Mobile’s first birthday, I thought it would be good to show you what exactly makes it tick. Put on your seatbelt, ’cause this is gonna be a wild ride! A few years ago, some of our engineers and designers were starting to become frustrated by the lack of a mobile offering. Phone apps were becoming increasingly important and, for many people, the primary way of interacting with their favourite services. In 2014, we got serious about putting an app in the stores. To remain focused, we decided to scope the initial version of the app to a small set of features: invoicing, expenses, and contacts. Once we decided on the feature set, the focus turned to how we could technically achieve this. Based on our experience with the previous solution, we decided to keep this app completely separate. We knew we could make use of our existing API to fetch the data, and we could add any missing features to the API as and when they were needed by the mobile app. By “eating our own dog food”, both the API and the mobile app could grow together into better tools for accessing FreeAgent. In the end we decided to go for a hybrid approach, as it seemed better suited to our team and the kind of app we were building. As our desktop app is built using Rails, this is what we tried to start with. Similar to our 2012 experiment, we tried having a Rails app generate the views, and render them in a native WebView container. However, just like before, this didn’t feel very native or fluid enough for us. (Basecamp do use a similar solution very successfully). It was component-oriented. This meant that we did not have to worry about raw DOM elements as much, and instead we could focus on the roles each part of our UI had, then compose these elements together. Simple data flow. By following a one-way data flow, and passing down data to children, it was really easy to understand what each component does when looking at its code. No more tangled data access mess, or forgetting to update DOM elements in callbacks! Virtual DOM. Each framework we tried implemented some of the above features, but React was the only one that scored well in all of them, and the only one implementing a virtual DOM. Allowing the framework to optimise rendering for us was a great feature, as we did not have to worry about writing this logic ourselves. Besides the vanilla Backbone behaviour we also added code for allowing Rails-style relationships between models. For example, we can say that an Invoice.hasMany('invoice_items', InvoiceItem), and our Invoice model now knows where to look and how to parse these invoice items into a Backbone collection of InvoiceItem models. Or we can say that an Invoice.hasOne('contact', Contact). This proved quite useful, as we could just call invoice.invoiceItems() or invoice.contact() from our React views without having to worry about the underlying logic needed to fetch these associations. Moreover, if the association wasn’t yet loaded, it would be grabbed from the API when calling these methods. While it has served us well over the past 18 months, soon we will replace Backbone with Immutable.js. This change should make it easier for us to optimise the mobile app and reduce the number of bugs that can arise from self-mutating objects. Flux is an application architecture that promotes unidirectional data flow and global app state. This fits React nicely as they are both built on the same ideas. Here you can see a diagram of the concepts involved in the Flux architecture. 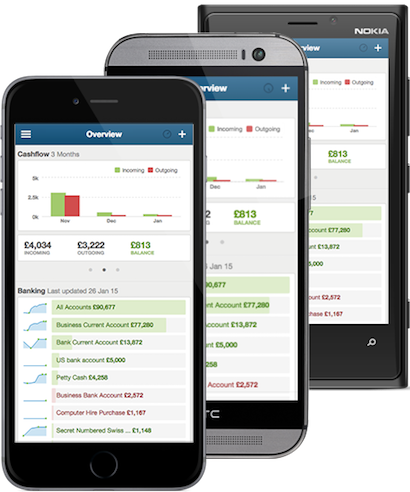 While our mobile app worked fine without Flux for the first few months, once we started writing code for banking we realised we needed a better architecture. One of the workflow requirements was: once a transaction is saved, the user should be returned to the bank account screen to act on their other transactions. The transaction would be saved in the background with its item disabled in the transactions list, only to be enabled again once the save was successful. This requirement prompted us to re-think how we structure data access in our app. Before introducing Flux, we were simply setting up the needed Backbone models when reaching a certain URL, passing them into the page component. The page component would in turn pass these down to its child views. This worked fine for isolated pages which didn’t have to “communicate” with each other, but this communication is exactly what our workflow required. We realised we needed some sort of property or event to tell the bank account page hosting the transactions list that this transaction is saving, disable it and this transaction has saved, enable it again. Because we could only send events and properties to the visible page on the screen, our solution had to involve some sort of global state. We tried implementing the workflow without Flux, but our solution ended up looking very much like Flux, so we decided to adopt one of the frameworks. We looked at this nice list of libraries, and decided that alt was a good fit for us. We liked the fact that under the hood it was really using Facebook’s flux implementation, and its API was simple to use and understand. Each store also contains a few read-only methods to grab data from it. For example, the BankTransactionStore has methods such as getTransaction(id), getTransactions(filter), and hasMorePages(filter). When TransactionExplanationActions dispatches one of these events, the store is alerted and the associated method is called to change the data inside the store. When data inside the store changes, any views listening to the store are alerted and will render themselves again. This architecture made it incredibly easy to implement our original workflow: just have the two views, bank account and transaction show, listen and fetch data from BankTransactionStore, add a processing attribute to the transactions in the store, and enable or disable the transaction in the list based on the value of processing. Now that I’ve explained the technologies behind the app, let’s see how they all fit together to power the FreeAgent Mobile apps. At the root of our UI, we have a MobilePager component. It is responsible for rendering and keeping track of visited pages (including the page visible on screen), and helping us push, pop, or replace pages. It also animates transitions between any pushes or pops. As you can see, the view is pretty simple, rendering NavBar and ViewContent as child components. Most other views follow the same pattern, with varying levels of complexity. In order to show interesting stuff, each page has to render its own subcomponents. In the ViewContent of each page, we add these subcomponents, whether they are containers or simply presentation components. What’s a container and what’s a presentation component, you ask? Here is a great article explaining the difference. In a nutshell, the idea is to make the components that show data as generic as possible, in order to promote reuse and testability. Then more complex logic or data fetching can be done in containers. These containers wrap around the presentation components, rendering them and providing them with the required data. In order to test our app, we have two different stacks: one for unit testing and one for integration testing. Unit testing allows us to check our React components in isolation, while integration tests simulate a real-world workflow of the app and check that everything is working well together. As I mentioned above, integration tests have a broader scope. Instead of checking the independent behaviour of a certain component, it checks that everything works together and makes sure the right API calls are being made. This can catch subtle bugs that are not uncovered by unit tests. I hope this tour of our mobile tech stack was interesting and helpful! We’re having a lot of fun building the mobile app with these technologies, and we’re really happy with the feedback we’ve received so far. Look forward to more stuff coming out of the mobile team soon. If you have any questions or feedback, please leave a comment and we’ll get back to you. Built with ❤️ by the FreeAgent team.